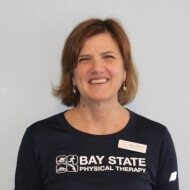 Jeanne has been the clinical manager of Bay State Physical Therapy in Scituate, MA since 2009. Her clinical experience in both orthopedic and neurological PT treatment has helped her to provide comprehensive care for her patients. Jeanne has taken many vestibular courses through the years through the APTA and BSPT sponsored courses at NU. Our Scituate clinic is fortunate to have the Micromedical inview goggles, which are necessary for accurate and effective treatment of vertigo. Jeanne specializes in vestibular rehabilitation and spinal dysfunction, including TMJ. She enjoys working with all patient populations in her community. Jeanne integrates various manual therapy techniques, including myofascial, craniosacral, extremity and spine mobilization. Jeanne designs individualized treatment plans with a strong focus on function. She is dedicated to helping her patients achieve their goals in a professional and caring environment.